What do you really want to eat for dinner? A big, juicy steak? A burger and fries? Maybe you would prefer Mexican or Chinese food? You also have to ask yourself this question: Can you eat what you really want to eat? If you have traditional dentures, you already realize the answer might be no. What if you could change that? What if you could feel comfortable walking into any restaurant in Muscatine or West Liberty, IA, and order anything your heart desired from the menu? Wouldn’t that be nice? It can be that way with the help of dental implants, which you can get at Gentle Family Dentists. If you want to learn more about implants and what they can do for you, keep reading. Better yet, schedule a consultation with one of our dentists by calling 563-288-2612 or contact us online. Dental implants are replacements for the roots of your missing teeth. Like your natural roots, you won’t see them, but you will understand that they can make a huge difference in your quality of life when you get them. If you’ve ever built a fence, you understand importance of placing the posts into the ground. If you just built the fence on top of the ground, you would not expect the it to stay in place too long. Implants can serve a similar role if you are replacing a single tooth or every tooth in your mouth. They are titanium cylinders or screws that are placed directly in your jawbone. 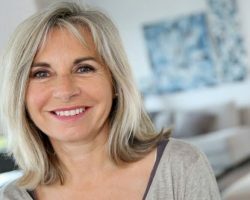 Today, we will be focusing on how implants can improve your day-to-day experience with dentures, but no that they can be used to replace any number of teeth. When you have implant-supported dentures, you can feel confident that they will stay in your mouth when you are telling a story or eating pork tenderloin with corn on the cob. Like the fence posts that are embedded in the ground, dental implants add stability, security, and strength to your dentures. Let’s assume that you have traditional dentures. This may be similar to what your grandparents or someone else that you knew wore when you were a child. Today’s dentures may look nicer, but they function about as well as the ones people had decades ago. Traditional dentures rest over your gums. This basically means they are floating in your mouth. They may have fit pretty well at first, but the longer you had them, the more likely they were to slip out of place. Trying to bite into certain foods (like the corn on the cob we mentioned earlier) may be more likely to leave you with an empty smile than a mouthful of food. Trying to chew other things (like that tenderloin) may seem more like a chore than one of life’s little pleasures. These problems aren’t just your imagination. Multiple studies have shown that denture wearers might regain about 25 percent of the biting power they had before they lost their teeth. That’s why eating certain foods — foods that you love — can seem so much more difficult. You can try using denture adhesives, but those benefits are temporary at best. Besides, the taste of the adhesive can overpower the flavor of your food, which kind of defeats the point. The reason your dentures can feel looser and looser the longer you have them is because something else is happening beneath your gum. Since you no longer have roots, your bone is getting smaller and smaller. This changes the shape of your mouth, which affects how your dentures fit. Implants make dentures stronger by creating a solid foundation of support. When implants are placed in your teeth, your jawbone responds to them the same is it responded to the roots of your natural teeth. After you bone has bonded with your implants, we can attach your dentures. This creates a direct connection from your dentures to your jawbone. This also creates pressure every time you eat, and that pressure helps to prevent your jaw from shrinking. And since your dentures are being held firmly in place by your implants, they will function nearly as well as a set of healthy, natural teeth. In contrast to someone with traditional dentures, a patient with implant-supported dentures can regain around 90 percent (and sometimes more) of their original biting power. This is why you can feel confident eating anything they want — and why you can get rid of the denture adhesives for good. Interested In Finding Out What Implants Can Do For You? Then call Gentle Family Dentists at 563-288-2612 or use our online form to make an appointment. We have offices in Muscatine and West Liberty to serve you.